We do not like stress and our mind seems preconditioned to erase memories of events that threaten how we look at ourselves. We naturally defend against anything that seems menacing to our ego. Our goal as always is to find comfort and satisfaction with who we think we are. Learning therefore becomes difficult when the challenges rise to a level that places our high self-esteem in peril. During these times, our brain may actually work against our own learning as it forces us to forget some of the things we might have just learned. Stress and a high academic self-concept can indeed combine to help us forget what our mind thinks is humiliating or just challenging. As a result, we cannot learn because of our pride and fear. A paper scheduled to be published in the Journal of Educational Psychology demonstrates that this forced forgetting does happen in education. 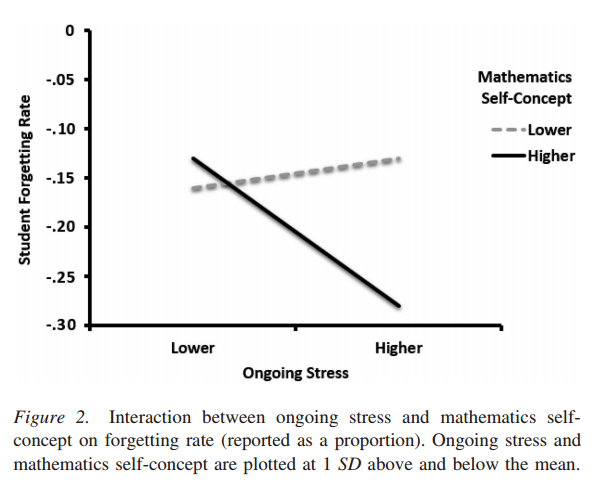 Undergraduate students enrolled in a multivariable calculus show diminished performance during stress if these students are also those who think highly of themselves. "For example, if a student cares most about looking smart in school and enrolls in an advanced calculus class where he quickly realizes that he is unlikely to look smart, he may disengage from the course, stop trying to contribute in class, stop trying to understand the material, and perhaps withdraw from the class altogether. However, if he cares most about learning, he is more apt to persist in the course because it is a valuable learning opportunity." In this respect, educators do find a great wall to overcome. Our society at the moment does not promote intellectual humility. Instead, we label ourselves, we label our children. We grow our egos but not our minds. As a result, we do not even want to listen to other people who do not share the same prejudices we have.